I had the opportunity to see Bohemian Rhapsody last night and let me say I'm so glad I did. It was an excellent movie, especially if you are a fan of their music. 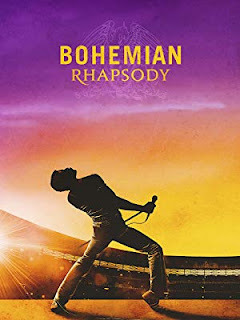 Bohemian Rhapsody celebrated the band Queen, their music, and their extraordinary lead singer Freddie Mercury, who defied convention to become one of the most beloved entertainers ever. I had the opportunity to see Bohemian Rhapsody last night and let me say I'm so glad I did. It was an excellent movie, especially if you are a fan of their music. While I can't say that I was ever a huge fan of Queen, there were quite a few of their songs that I absolutely loved and Bohemian Rhapsody was one of them. Rami Malek did an excellent job of portraying Freddie Mercury. I liked some of their music but not all of it - I would like to see this movie. Isn't it great?? I came away feeling sorry for today's kids because of the crappy music that they have to listen to. Such talent these guys had! Yep, you can't beat the music from back in the day. That could very well be true. I'm glad you had a great time seeing the movie. It's good to do something fun now and then. One of my favorites this year. Would you believe the only one I've seen in a really long time. I missed it, we kept talking about going and then it slipped by at the movies, we seldom go anymore but we did see I Can Only Imagine and then I saw that one is on Netflix. If you liked this one, I'm sure I will also, I will ask for it on DVD at my library. Glad you mentioned it. It should have been picture of the year! I saw Green Book (the winner) and I can say B R was snubbed by Hollywood! I went to see 'Queen' live way back in the 70's at the Brighton Centre, he was amazing. I still miss him so much, his voice was so unique. Haven't seen the film yet and am a bit worried that I will be disappointed. I'm so glad you went and had a good time! I love it when you have some fun. I agree! This is a great movie! Loved that Freddie loved kitties too! Sounds like a great movie. I will have to see about watching that one. Have a great week Ann. HAHA.....cut and paste? I hate when I do things like that on my blog. I have not seen the movie but i have heard nothing but great things about it.....and I LOVE QUEEN. I am always happy to have a movie recommendation and plan to check this one out. Thanks! I know! I was not necessarily a fan but OMG I loved the movie so much. I'm so glad you saw it. Rami was amazing and won best actor for the Academy Award.